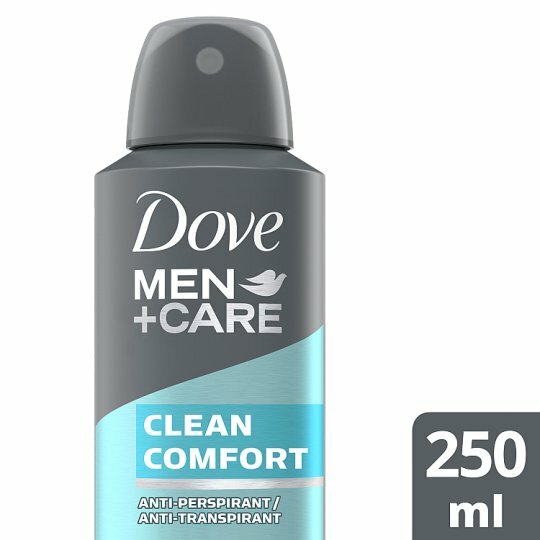 Dove Men+Care Clean Comfort Anti-perspirant Deodorant 250ml has a clean and subtle scent to keep you feeling fresh and dry for longer. How to use: Firstly, shake the Dove Men+Care Dove Men Clean Comfort Anti-perspirant deodorant can well. Then hold it 15 centimetres away from your underarm and spray evenly in a well ventilated area. Avoid contact with eyes and broken skin. Why not try it alongside our Dove Men+Care Body and Face Wash for lasting comfort and freshness? Dove Men+Care Clean Comfort Anti-Perspirant deodorant also comes in a smaller 150ml, making it perfect for your gym bag, or in your luggage for when you are on the go.